It’s honestly sad that Valve has not released any official Portal-related items to the masses, as a market for them clearly exists. As the saying goes, “necessity is the mother of invention”, and [Jamie] needed a Weighted Companion Cube in the worst way. Actually he constructed his Companion Cube in order to test out some modifications and upgrades he performed on his homebrew CNC Mill. Judging by how the cube turned out, and the fact that he was able to keep tolerances within .005”, we would say that his mill is working just fine. The cube was designed in Solidworks, and passed through the BobCAD plugin to generate the GCode for the mill. The base of the cube was machined out of a 3” solid block of aluminum, hollowed out on one side to give him access to the cube’s innards. He milled out heart shaped openings on each side, covering them with frosted Lexan. He added a BlinkM to the mix, mounting it on the cover plate he milled for the open side of the cube. Once lit it cycles through several colors, including the pinkish tone anyone who has played Portal is quite familiar with. We would say that it’s a great job, but it doesn’t do his work justice – it’s absolutely stunning. We’re not just saying that because we want one, though we do want one…badly. I really hope Valve are enlightened enough to be cool about it and not (eg). whack him with a C&D). This is so well built, very impressive. Actually, I thought this thing looked huge from first glance. I guessed it was about 12″ on each side. That’s a good indication of the milling and finish quality. Absolutely huge kudos and nerd points for this. Is there anyway to get the swd for this? Where’s the “hack” in that? how is there “no official Portal-related” merch? did you even look at Valve’s official store? There’s merch for Portal AND Portal 2. Also, this isn’t a particularly good copy – the corners and edges are all wrong. Portal is boring, but I like this. Great use of hacked tools to make a neat real-world-imported thing. @marcus; I make items in real life copied from movies and Second Life, but the opposite isnt always possible, hence the popular skilled Second Life scripter/builder group NPIRL (Not Possible in Real Life). Maybe he might be limited with his setup, or it would be too fragile if certain details applied? I’d love to make one, but I don’t have a mill (yet!) and shapeways offers me a way to get one. Doh! Stupid me. I forgot. It’s valve’s idea, so they’d come down on any sales. I would like to see a weighted edgeless safety cube next. @wardy I don’t think Valve has or ever would send a C&D for something like this. It’s honestly sad that people spout their mouth off without thinking “Hm, I wonder if Valve actually DOES sell things that I might want to purchase” and doing 5 seconds of googling. I’m sorry, the statement might have been a bit misleading, but perhaps I was speaking from my own wants. If you read the first sentence again, just mentally insert “desirable” before the word official. I do not desire to own a piece of Portal clothing, a poster, or a glass – which seem to be the only items available from Valve’s official store. Even ThinkGeek’s offerings are “meh” compared to this cube. 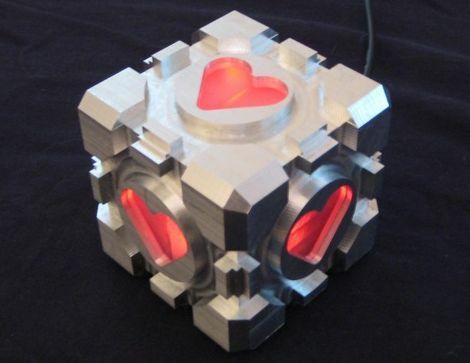 Some of us would be interested in items from the game, such as turrets, a GLaDOS figure, perhaps a model of Atlas and Peabody – or like Jamie built, a companion cube. This demographic is left out of the Portal marketing blitz as can clearly be seen by the amount of fan-crafted Portal items floating around online. @marcus & really?REALLY?, have you actually looked at the TOTALLY UNDERWHELMING range of Portal 1/2 stuff available? It’s just what the geek/gaming/fan world wants and needs, more logo’d tshirts, mugs, stickers and bloody iPhone covers. Where are the interesting and unique to Portal items? like near perfect replica companion cubes, Wheatley, talking turrets etc. When I heard Portal 2 was coming out and looking at the preview clips I was very much looking forward to it and some decent merchandise, the game is great, the merchandise leaves a LOT to be desired. Thanks for the kind comments. I’m not really set up to make lots of them, so I’m only making three – one for me, one for a friend as a gift, and one for display at the SF Open Studios this fall. I didn’t have some of the needed tooling (small chamfer mill…) and figured there’s some artistic license that could be had there. Back to the discussion of coolness; now just mask off the edges and such and send it out for some hard anodizing to both get the finished look and make sure that look never fades or wears. Face it. You all just want the long fall boots.